The 51-year old Slovenian, who was elected as UEFA’s seventh President in September 2016, was confirmed in office by acclamation on Thursday by delegates from UEFA’s 55 member associations, and pledged that “unity, hope, respect and solidarity” would be key elements in UEFA’s strategy, mission and activities during the next term of his presidency. Mr Čeferin insisted that, despite recent successes and positive developments, in particular concerning the spirit of unity that was prevailing across European football, UEFA would not tread water in fulfilling its role as the governing body of the game on this continent. “The most dangerous thing we could do is to rest on our laurels and bask in our current situation,” he reflected. “We are in a fairly remarkable position, but that is not enough. “In a world of constant and increasingly rapid change, where time seems to go ever faster and every day brings a fresh challenge, we are going to have to do more than simply adapt. We are going to have to think ahead and undertake some major developments. Women’s football, he promised, will be taken to a new level thanks to the UEFA Women’s EURO in England in 2021. 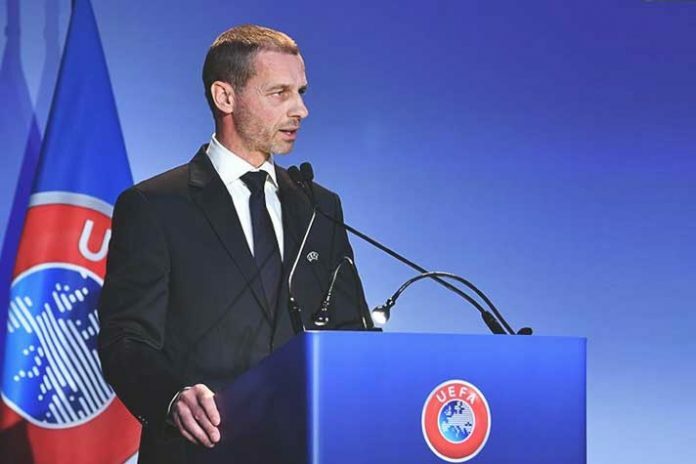 The UEFA President said that focus would be given to grassroots football and education, while concerted work would be devoted to making ‘football fairer’ through the further development of the financial fair play system that has helped restore stability to European club football. “We will adapt the financial fair play rules to establish a new European balance in which everyone can find their rightful place,” he explained. “The initial objectives of financial fair play have been achieved. European clubs are financially healthier than ever, the problem of debt has been sorted out in many countries, and unpaid debts owed to clubs, coaches and players seem to be becoming nothing more than a bad memory. Mr Čeferin sounded a note of caution in relation to the work that lay ahead – “Please don’t expect any miracles,” he said. “History always tends to repeat itself, and anyone who claims they can change the course of history simply by waving a magic wand is either a dreamer or a charlatan. “How can we perform miracles when we know the problem of competitive balance has always been in existence? When we live in a world where 1% of the population owns more than 50% of the planet’s wealth? “How can we perform miracles in a society racked with doubt, where an inward-looking attitude seems to be the only way to survive? Where the desire to put up walls is stronger than the desire to build bridges, and where helping yourself has become more important than helping others? “What I can promise,” the UEFA President concluded, “is that, during this next term of office, we will work together to ensure that European football remains united, that European football remains respectful, respectable and respected, and that European football continues to demonstrate solidarity and bring hope.